Image kindly provided by Simon Muggleton. George Barker was born in Ripon Yorkshire in 1917 and he was one of three children born to Bethel and Jenny Barker of Bellwood Farm Ripon. After leaving school he entered the RAF in 1936 and was sent to No 2 FTS at Digby, and then posted to 80 Squadron at Debden. On 10 May 1938, the squadron was sent to Ismailia Egypt together with 33 Squadron to protect the Suez Canal. ‘C’ Flight included Flight Lieutenant Ralph Evers-Swindell, Flying Officer Peter Wykeham-Barnes, Flying Officer Harold Sykes, Pilot Officer Frankie Stubbs, Pilot Officer Wanklyn Flower, Sergeant Barker, Sergeant J. H. Clarke, Sergeant Edward Hewett and Sergeant Kenneth Russell Rew. Barker's logbook shows over 153 'sorties' with a flying time of over 300 hrs in this battle zone. On 4 December, four newly arrived Gladiators from 112 Squadron on detachment to 80 Squadron and 11 of the resident Gladiators were flown up to Yanina for further operations, from where Squadron Leader William Hickey led 14 aircraft on an offensive patrol over the Tepelene area. Here an estimated 27 CR.42s were seen. 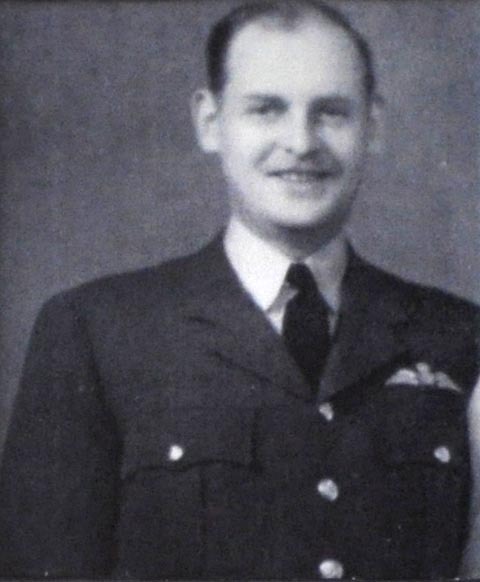 Flight Lieutenant 'Pat' Pattle claimed three CR.42s shot down, one onto a hillside north of Delvinakion, one in flames from which the pilot baled out, and after his own aircraft had been hit in the main fuel tank and a wing strut, a third from which the pilot was also seen to bale out. He claimed a fourth as a probable when it poured black smoke. He then attacked a fighter, which he identified as a CR.32, which stalled into cloud, claiming this as a probable also. Sergeant Edward Hewett claimed two CR.42s and a G.50, whilst Pilot Officer William Vale, Sergeant Donald Gregory and Sergeant Barker each claimed one CR.42 for a total of nine victories and two probables. Barker’s victory was claimed at Klissoura. On 13 February 1941 the Gladiators of 80 and 112 Squadrons escorted the Blenheims from 84 (these took only part in the first attack) and 211 Squadrons during two attacks on Tepelene. During the second attack Squadron Leader 'Tap' Jones led the Gladiators down in a machine-gun attack on the Italian positions in the Tepelene area. AA was intense and several Gladiators were hit by shrapnel. Sergeant Barker’s N5761 was hit in the engine, and he was obliged to try to force-land 40 miles north of Yanina in a small clearing, but the ground was too soft. The Gladiator somersaulted and was completely wrecked. He was, however, unhurt and returned in a Greek army truck. At the end of February the squadron’s Gladiators were replaced with Hawker Hurricanes. 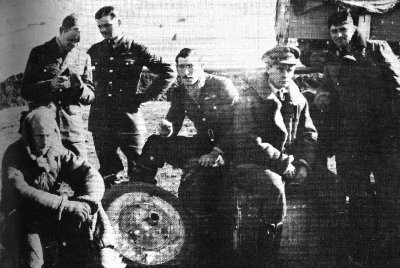 (Left to right): Sergeant Casbolt, Sergeant Barker, Sergeant Gregory, Pilot Officer Vale, Flight Lieutenant Pattle, Pilot Officer Cullen. On 17 April Sergeant Barker set off to drop a message to the 19th Australian Brigade at Katerine. Having completed his task he was intercepted by three Bf 109s, apparently from JG 77, which he managed to evade, claiming one shot down from which the pilot was seen to bale out in the Mount Olympus area; this was confirmed by the Australian troops. JG 77 was out to attack shipping and airfields near Volos. One aircraft off III/JG 77 was hit by AA and 60% damaged, the pilot crash-landing at Dojransko on return, but no aerial combats were reported. On 23 April he claimed an unconfirmed Do 17 shot down south of Argos and a Bf 110 as a probable. Five replacement Hurricanes arrived at Argos from Maleme later during the day, flown by 80 Squadron pilots. No sooner were those down however, when hordes of Luftwaffe aircraft appeared overhead, the Germans having discovered the whereabouts of the RAF fighters. An estimated 20-25 Do 17s made a level bombing attack from altitude, followed by a similar number of Ju 88s which dive-bombed, escorting Bf 109s from II and III/JG 77 then sweeping down to strafe. A taxiing Hurricane was hit by a cannon shell, run into a ditch and turned over while for more Hurricanes managed to take-off and fly away. Most of the remaining aircraft were destroyed on the ground together with a handful of Greek Avro Tutor trainers. The hit Hurricane was piloted by Sergeant Barker, who was wounded and burned. Other pilots hauled him out of the cockpit and helped him to a nearby slit trench. An additional Lysander from 208 Squadron was shot down by Oberfeldwebel Herbert Kaiser (victory no. 4) from 8./JG 77. Barker was evacuated to Egypt. According to his logbook he had also claimed a Do 17 over Peleponesus which he records as 'broke up', a CR.42 as a probable (spinning- bits flying off) and a Bf 110 (confirmed bursts seen in the cockpit) during the Greek campaign. These claims were unfortunately made on unknown dates. After recovery he was posted to 108 Ferry pool and the Met Flight at Ramlesh. He returned to the UK in June 1942 aboard the troopships Isle of France and Empress of Russia. He was subsequently commissioned and promoted to Flying Officer on 3 january 1943. In September 1943 he attended No. 50 Course at Cranwell College and was posted to 15 OTU at Harwell and RAF Eastchurch in March 1944. He married Mary Blinkhorn in 1943, ’Cas’ Casbolt being his best man. He finished his war service with 1682 Flight at Enstone and 22 OTU at Wellsbourne having several night interceptions recorded. At the end of the war Barker was credited with one biplane victory and a total of two. According to his logbook he flew 27 sorties plus 27 patrols in Libya and 96 sorties plus 10 patrols in Greece totally being engaged in 25 combats with enemy aircraft. Totally he flew 1796 hours. 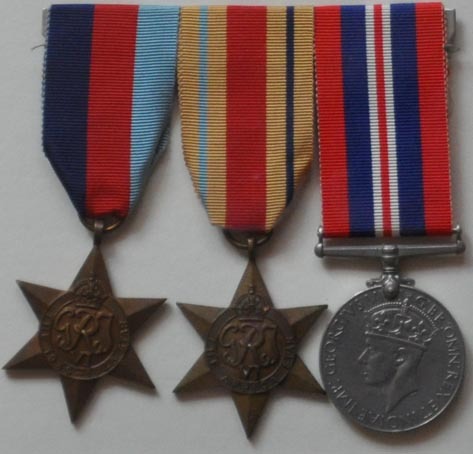 1939 to 1945 Star, Africa Star and War Medal 1939-1945. After the war he became a photographer with his brother in law Martin Blinkhorn and then operated a post office in Watlington, South Oxfordshire, in 1957 with his wife and two daughters. He died suddenly in 1964. TOTAL: 2 destroyed, 2 unconfirmed, 3 probables. (a) 150o Gruppo C.T. lost two CR.42s against RAF claims for 9 and 2 probables when Tenente Alberto Triolo and Sottotenente Paolo Penna were killed. (b) Probably claimed in combat with Bf 109s from JG 77, which didn’t report any aerial combat neither suffered any losses. (c) Claimed in his logbook but not officially credited to him. Additional information kindly provided by Simon Muggleton.